The first round of the 2016 Malaysian Superbike Championship was held at the Sepang International Circuit as a support race for the World Superbike Championship. 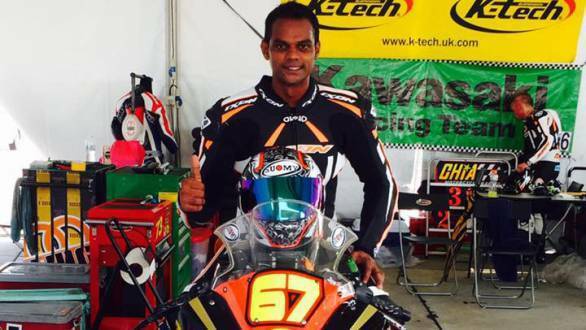 K Rajini, reigning Malaysian Superbike Champion in the 1000cc class competed in the first round astride a 2013 Kawasaki ZX 10R. During qualifying, he managed to put himself fifth on the grid, after facing tyre issues in the wet conditions that prevailed. During the first race, Rajini was running in second position for the first six laps. With two laps to go, suspension issues cropped up and his bike began sliding around far too much in the corners. This meant he dropped down the order and finished the race fourth. The second race was declared a wet race. With the track really slippery, the Indian rider, who competes for Team Chia Moto, was only able to finish fifth. However, there's hope for the upcoming rounds of the championship, as Rajini will now trade the 2013 motorcycle for a 2016 Kawasaki Ninja ZX10R. This means that he is likely to be more competitive in the next few rounds, and has a real shot at defending his championship title. On another note, Rajini is still trying to raise the remaining funds needed for his 2016 season. There's only a few days left to help him achieve his target. Click here to help him in his crowdfunding effort.